IF I can find it I use a professional grad ratchiting crinper I got to admit the crimps it turns out look 100% professional. I have used it on wire up to 10ga in fact teh wire is right in front of me. 40 amp poles or so they are rated. Last pair I put on I used the "Crimp" feature of a pair of needle nose pliars but it was much smaller wire and I had do do some additional "Crimping" to get it to grip properly but its solid now. THat connection is in the other room. The 30 amp powerlines are simple to crimp 12 to 14awg wire. For 10 awg you need the 45 amp. Or destrand it to 12awg thickness. The 45 amp powerlines are difficult to crimp properly without their special tool. I went years crimping 8awg Into the 45s before acquiring the special anderson crimptool. I bought some dies for flag terminals and insulated terminals. Which fit into the anderson crimpers making them multipurpose. I also remove the little plastic anderson spoon contact holder and crimp non insulated terminals with the anderson dies. The 30 amp contacts are very easy to assemble without the special crimper if one has a dimple crimper But the special C likely does a much better physical and electrical connection. If you are near NCSD coastal. I can make up your cables if you bring the 45 amp powerpoles. I've been using Anderson PowerPole connectors since the 90s. I use them at home, and at work. I've purchased and installed thousands of them. Absolutely excellent product! Be warned there are cheap knock-offs that don't fit/work as well. Found those on eBay and Amazon (surprised me). Sent those back. Consequently, I buy all my stuff through Powerwerx (no affiliation). I have a couple of their crimpers, which work much better/faster than soldering the contacts to the wires. The nice part is you can buy a kit of the 30A size (most common), and order additional 15A and 45A contacts. All three sizes fit in the same housing, but these give you the ability to use different sized wires for different applications. I also have a mix of colors for differentiating different circuits. One note on power poles.. They do tanish and if you are not hauling enough current to burn it off you need to unplug-replug from time to time. 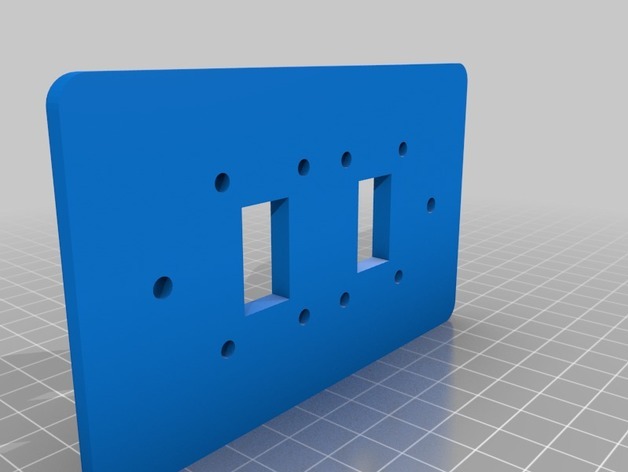 I'm installing an outlet cover plate in the motorhome that has a couple of Anderson Powerpole connectors mounted to it. This will be mounted into a low voltage style electrical single gang box (not enclosed). This will allow me to plug in Ham radio gear (etc.) that I'm already using Anderson connectors. 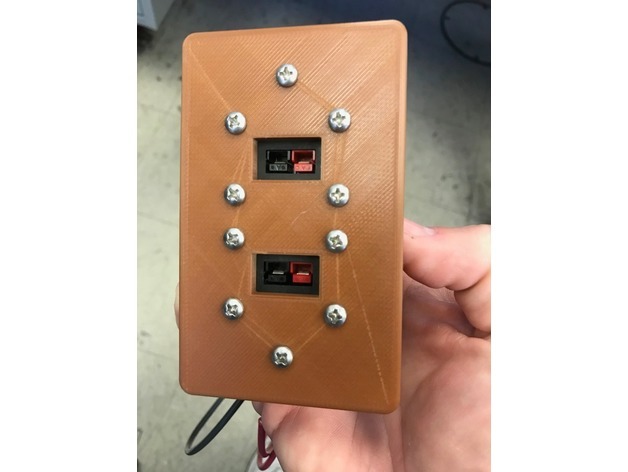 I designed the plate in Fusion 360, and printed it on a Creality CR10S printer. A lot of great info. Thanks to all. Not of any help but I was digging around last night looking for something (no joy but turns out I did not need it) and Murphy's law of how to find stuff kicked in.. Since I was NOT looking for the power pole crimper.. I found it. A nice west mountain ratching job.. along with my older stock of PP's Too bad I didn't need it but on reflection I could have used it. The Problem I was trying to fix was an intermittent between a 12 volt accessory outlet and the 5 Volt USB device that plugs in. turns out the problem was in the socket itself so I cut the thing off. 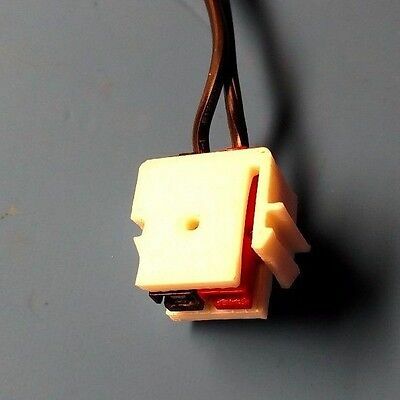 Fired up my new soldering iron (It gets nice and hot if I open the gas valve all the way) and soldered the leads direct to the adapter Taped it up good and now its ... Working. Very well. Benz-o-Matic soldering iron. Run on Ciggy Lighter Butane. Very nice Very hot. You can find everything you need at Powerwerx.com. Their prices are reasonable. I used SB-50 connectors for my portable solar install. The SB series connectors come in several colors but make sure you stick with one color because they are keyed differently. For instance a grey connector will not plug into a red one.